Posted 3/1/2018 4:32pm by Kelly Leach. It's here! 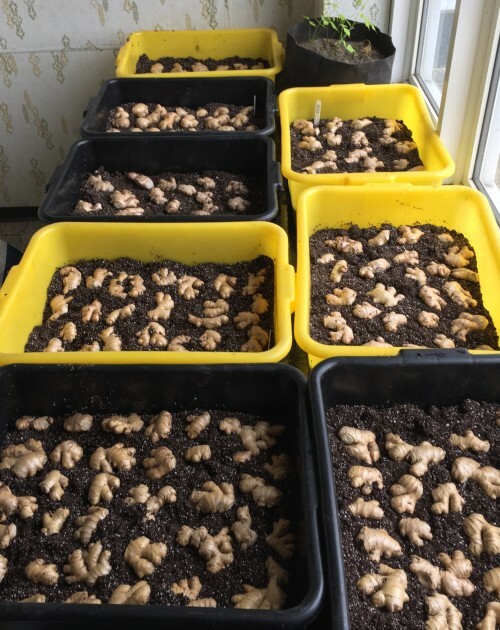 Last November I ordered 15 pounds of ginger from Hawaiian Organic Ginger in Pahoa, Hawaii, 5 pounds each of Yellow Hawaiian, Bubba Blue and Khing Yai. A few years back on a trip to Hawaii we spent a day with Biker Dude learning about ginger, turmeric and more. It was very interesting! 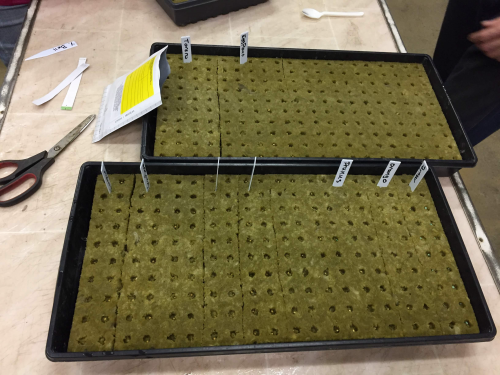 As soon as the ginger hands arrive we put them into a soil-less germinating mix that we keep on hand for seed starting and onto the heat mats at the office. In a few weeks those hands will develop buds and eventually shoot up some leaves. Once the soil temperatures in the high tunnels are warm enough we'll transplant it. Even with warmth and plenty of water ginger grows slowly. Harvest will begin in September! 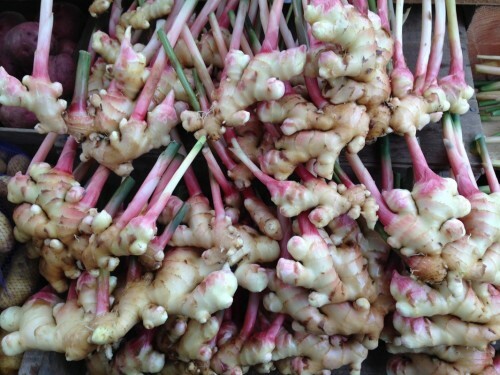 Baby Ginger is a real treat, and nothing like the ginger root available in grocery stores, which for the most part comes from China. I love to make ginger tea, candied ginger and pickled ginger with it! Posted 2/19/2018 10:08pm by Kelly Leach. How quickly the weather changes! Most of our snow was gone by nightfall thanks to the rain we got during the day. Predictions are for up to 2" of rain, which if were snow instead would be about 24" of snow. That wouldn't be good for most of us. Flood watches have now been issued for all of Southwestern Michigan. We aren't near any rivers or creeks so are not too worried. But we're not excited about the mud that is sure to come. Do I think winter is over? Hardly! This is Michigan. As much as those of us who live here grouse about the weather most of us wouldn't want to live, or farm, anywhere else. Posted 2/15/2018 2:25pm by Kelly Leach. 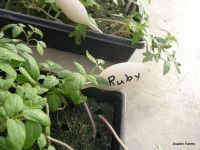 Last week while we were getting 12" of snow Kelly and Amy seeded 2,000 tomato plants, putting one teeny tomato seed into each hole of the 1" rock wool cubes. This morning Larry stopped by the office to tell me the seeds have started to germinate. In a few weeks the plants will have real leaves then they can be moved into bigger rock wool cubes. A few weeks after that the plants will be tall enough to put on the coco coir slabs and clipped to the strings where they'll remain until November. By then the stems will be somewhere in the range of 30' long. Next week we'll get some lettuce started. 2018 growing season is underway. Posted 4/6/2017 9:30am by Kelly Leach. Lots of rain lately, things are pretty muddy around here. Water tables are high which is problematic for some but we're pretty high here so it isn't a problem and we'll appreciate that water come July and August. The potholes in our fields will have standing water but that's about it. Wet ground prevents everyone from getting into the fields too early anyway so that's probably a good thing. Snow storm today with wind. 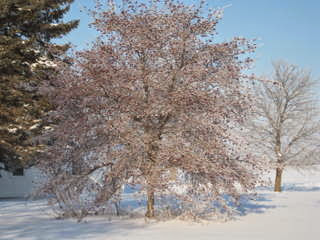 The grass was white with heavy wet snow when I got up this morning. Not my favorite thing to see in April but it is what it is. Kelly just lost electrical service at her house at our East Farm. Needless to say she is not thrilled. Probably a tree branch took out service somewhere. Our power company is typically very responsive though so it shouldn't be out too long. Fingers crossed. Tomatoes are all moved into the tomato house. Salad greens are planted in the lettuce house but not much growth going on...need some sunshine. The ginger plants I've been nursing in the office for months...on a heat mat with a grow light...are doing fine. I missed out on getting more ordered from Hawaii so I'm thrilled that I saved some from last season. I've seeded kale and collards for the high tunnels but have held off planting either for now. The weather forecast improves next week so things will really start moving. We'll be busy! Posted 10/15/2014 9:49am by Brigette Leach. Thanks giving share information is available on the website. We will offering both delivery and pick up at the farm option. Please let me know if you have any questions. Posted 3/10/2014 10:46am by Brigette Leach. Today is supposed to be temps in the 50's which get us all excited that summer is right around the corner. This winter has been a tough one on the farm. Lots of snow and bitter temps mean that pipes froze, greenhouses sat empty and we have cabin fever. But we are looking forward to again offering the Share of the Farm to you. You will find the usual full and small shares, but we are now offering as a pick up at the farm only mini share. We hope it fits a single person house hold better than a small share. Our add-on are still the same as previous years. As always we are looking for community drops sites. If you are interested in hosting please send me an email. If you would like to pay with a credit card please let me know and we will invoice you electronically with a link you can use to pay your invoice. The service we used in past years is no longer available so we have been looking at other options. You can contact me at avalonorders@yahoo.com if you have questions.